"Great recipe! I used the green chile enchilada sauce instead of the salsa. This was the best!! Everyone went back for thirds!" Size-Wise: Enjoy this spicy meal, but keep an eye on portion size. Shortcut: Substitute 2 pkg. (6 oz. each) OSCAR MAYER Deli Fresh Oven Roasted Chicken Breast Cuts for the cooked shredded chicken. Special Extra: For a spicier flavor, add 1 can (4 oz.) chopped green chilies, drained, to the filling mixture and prepare as directed. This recipe was fabulous! The only thing I added was half a packet of Old El Paso Taco Seasoning Mix as I cooked the chicken. The kids ate seconds! These were really good, I used pace hot picante sauce didn' t have cilantro and as always used garlic powder. 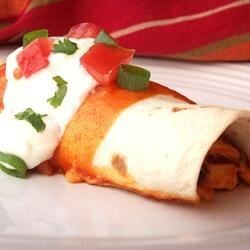 Very interesting enchiladas! !